Welcome to The Open University Branch of the University and College Union's website (OUBUCU). 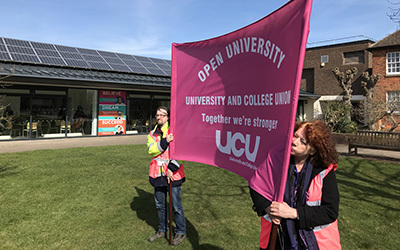 If you are employed in an academic (including Associate Lecturer), Academic-Related, Research or Research Student role by The Open University, UCU is the Union for you. We represent all staff in those grades. This means that we have an important role to play in protecting YOUR interests and YOUR employment – salary, conditions, professional concerns, and individual problems. Nationally, the University and College Union (UCU) represents over 110,000 academics, lecturers, trainers, instructors, researchers, managers, administrators, computer staff, librarians and postgraduates in universities, colleges, prisons, adult education and training organisations across the UK. If you have a problem at work then we have trained caseworkers who can support you. UCU campaigns for improvements in the pay and conditions of further and higher education staff across the UK and for the provision of high quality education opportunities. Currently involved in the national UCU Higher Education pay and equality dispute. We've had a reply to the joint letter we sent to the Open University's Vice Chancellor: view letter. The OU UCU Executive Committee would like to express its sorrow and outrage at the recent terror attack in New Zealand.